Follow these instructions to export your existing Address Books from Bloomland's Legacy Email Services platform. For best results when importing your exported Address Books into Bloomland's New Email Services platform or other Email Messaging clients, make sure you select "Outlook 2003 Contacts" option during the export process outlined below. Please note that these instructions are ONLY Valid before your existing Email accounts hosted by Bloomland are upgraded/migrated to Bloomland's New Email Services platform! After the upgrade/migration has been completed, you'll need to contact support at Bloomland for assistance in exporting your old address books. Login to your existing Bloomland hosted legacy Webmail client using your browser. Select the "Preferences" Tab as shown below in Figure 1. Click the "Import/Export" tab as shown below in Figure 2. 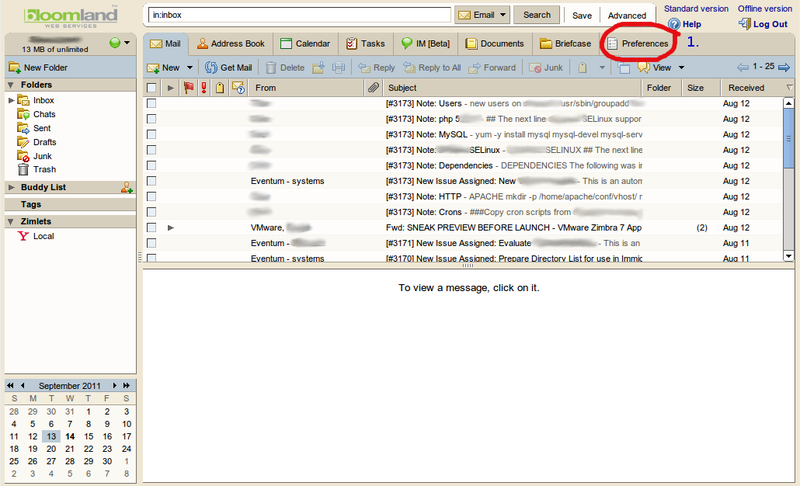 Click the "Source - Browse..." button to display the "Choose Folder" Pop-Up window as shown above. This is where you can select which Address Book you like to Export. Select the Address Book you like to export during this export session. Please note that you can ONLY export one Address Book at a time! Click "OK" in the "Choose Folder" Pop-Up window to proceed. 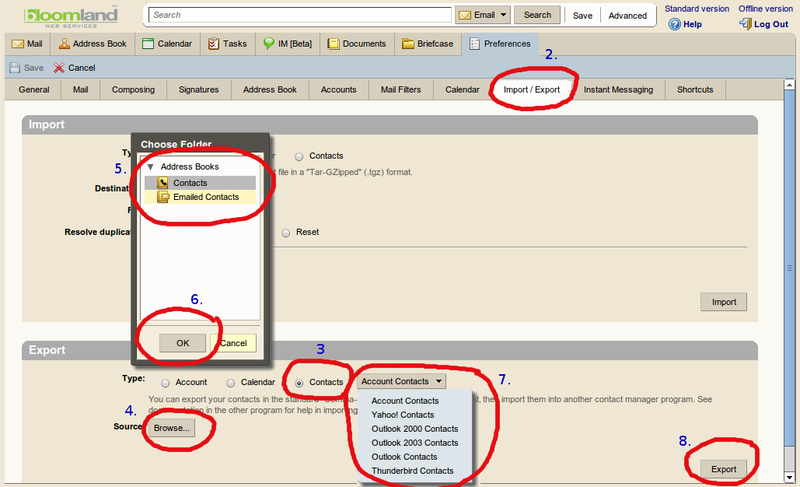 Click the "Account Contacts" drop-down list to select the export format for your selected address book. Please note, for best results, select "Outlook 2003 Contacts". Click the "Export" button to complete the Export procedure. After you click the "Export" button, a "Save As" type pop-up window (depending on your computer's OS, the title of the pop-up window will vary) is displayed. This is where you can specify the location (folder/directory) in which the exported Address Book will be saved to. It is important that you record/remember the exact path and filename of this exported address book so that you can find it again when you need to import this address book into other Email Messaging platforms. It's also advisable that you make a backup copy of this exported Address Book file for safe keeping purposes.